It’s Been 80 Days Since the Last U.S. Military Combat Death. That’s Remarkable. An honor guard team carries the casket of U.S. Army Sgt. 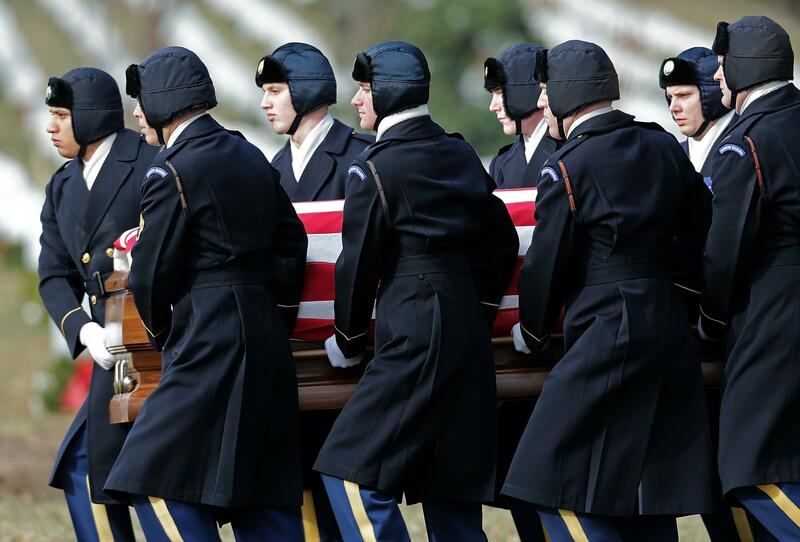 1st Class Ramon Morris, during his burial service at Arlington National Cemetery on Jan. 23, 2015, in Arlington, Virginia. The Washington Post’s Dan Lamothe noted a pretty incredible milestone last week: Last Wednesday marked 75 days without a U.S. military combat death, the longest period since before 9/11. It hadn’t gone over 50 days since before the U.S. invasion of Iraq in 2003. The last U.S. fatalities, Spc. Wyatt Martin and Sgt. 1st Class Ramon Morris, were killed by an improvised explosive device in Parwan province, Afghanistan, on Dec. 12. American civilians have died in combat zones since then, including ISIS prisoners and contractors killed by the Taliban in Afghanistan, and Congress’s passage of a new bill to prevent veteran suicide earlier this month is a good reminder that not all war deaths happen on the battlefield. But this is still a remarkable and long-overdue development. It also comes at a time when the U.S. military is ramping up involvement in the ISIS conflict, maintaining a presence in Afghanistan that’s not technically a combat role but still involves a fair amount of combat, and waging an ongoing drone campaign in Yemen. Meanwhile, neither Congress nor the White House seems to be in much of a hurry to place limits on the use of the American military or even define the conflicts it’s fighting. Lamothe’s article was pegged to a panel discussion in Washington at which the father of a U.S. airman killed in Afghanistan questioned a self-described “hawkish” congressman, Rep. Adam Kinzinger*, on whether he was aware of how long it had been since a soldier was killed. (He was not.) “When you talk about being a hawk, maybe that is something that you’d really want to keep track of,” the father, Fred Boenig, told the congressman. While it’s absolutely encouraging that American soldiers are dying less often after a draining and bloody decade, it would be a mistake for political leaders to take this to mean that war can be waged indefinitely without consequences. Update: This post originally misspelled Rep. Adam Kinzinger’s last name.